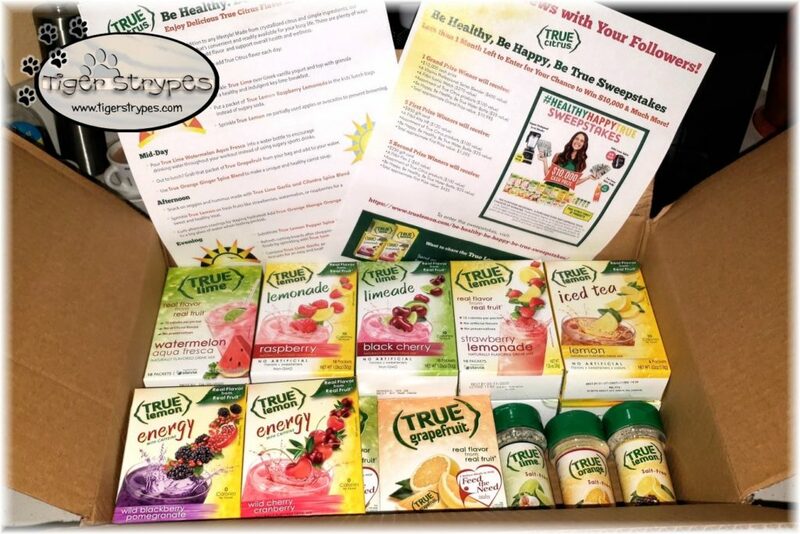 Thank you True Lemon for partnering with me on this blog post! Drink More Water with True Lemon!#TrueLemon #TrueCitrus #ad #HealthyHappyTrueI recently got to try out some of the new True Lemon flavors for making your water a little less boring. There were limeade options, berry options and even some with a bit of caffeine for energy. I learned quickly that you don’t need much to make it taste great. I used a full envelope for 16 oz of water, as advised and it was just WAY TOO sweet for me. Using half makes it perfect. 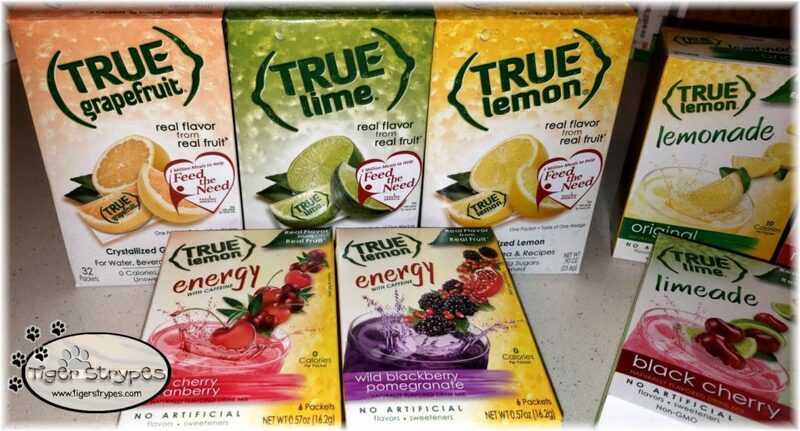 Great fruit flavors, healthy alternative to soda and easy to take with you on the go! Water is good for you not only because of the great things it does for your body but because it’s a great alternative to sweetened, caloric beverages like soda, fruit juice, sweetened iced teas and even drinks that you may not suspect, like Vitaminwater® which has 120 calories and 32 grams of sugar in 20 ounces. (Here’s a fun fact: Just switching out one can of soda or other 120 calorie drink per day for one glass of water can lead to an almost 15 pound weight loss in the course of a year without doing anything else.) And all you diet beverage drinkers, don’t think you’re off the hook. Consumption of diet sodas has been linked to weight gain and Type 2 diabetes. For those who like sweet, then we have 9 delicious options for you. 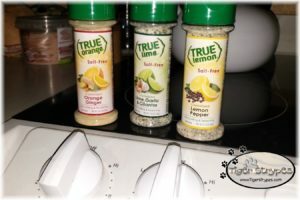 True Lemon even has seasonings now, as well!! According to the Centers for Disease Control, 9 in 10(!) Americans consume more than the recommended limits for sodium. The sodium limits, as recommended in the 2015-2020 Dietary Guidelines for Americans, state that people over the age of 14 should consume no more than 2,300 mg of sodium per day – the equivalent to 1 tsp of salt – and less if they are younger. An excess of salt in your diet can lead to high blood pressure, which raises the risk of cardiovascular diseases, including heart attack and stroke. Wow, that’s pretty grim. But we have a delicious, salt-free way to flavor your food. It’s a joy to work in our small but growing company, with people we really like and respect, to create products that we and our customers love. But we’re not only lucky, we’re also honored. Because every day we hear from our customers who write or call us just to say how much our products mean to them. 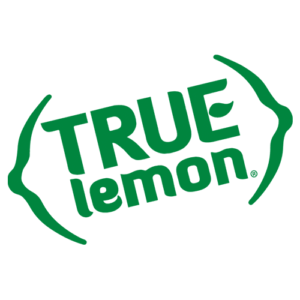 Whether it’s a mom who called to say that her family has given up soda completely because she discovered True Lemon® Lemonades and her kids love them. The home chef who emailed to share with us that he now exclusively uses True Lime® instead of lime juice in his recipes. A 28-year-old who told us that for the first time in her life she’s drinking water because she found our products. Or the grandfather who couldn’t bear to give up seasoning his food with salt until he bought our salt-free, citrus spice blends. We’re humbled to say that, like the people above, over the years thousands and thousands of customers have contacted us to share their True Citrus love. And we hope you will also find the True Citrus products that you love. When we started this company almost 15 years ago we started with this commitment. And we also started with the commitment to treat customers the way we want to be treated. (Just like our moms taught us.) So that’s why we have a 100% guarantee of satisfaction that we always stand behind. That’s why we put our phone number and email address on every box and every packet. And that’s why we’re here to answer your calls and emails. So drop us a line and share your True Love. Some just don’t like it – these can make a big difference and not make all of us Mom’s worry about what we’re adding! I love that these have stevia. I drink them all the time. The lemonade is my favorite. That’s definitely a great one! I never knew that they had so many other flavors. I had no idea these came in so many flavors. We had a limeade variety and it was delicious! Oh this makes it SO MUCH EASIER to drink more water every day! For sure! Plus, you can put in as little, or as much as you want! I only drink ice water and I enjoy it. I had my fill of pop, coffee, juice cocktails (they taste like someone poured in the sugar bowl and stirred) in my younger decades. I do now and again desire something just a bit different and I love lemon mixed with anything. The best part of Your True Lemon is that while I am trying to protect my grandchildren from the terrible health I have they see every one else with sugary drinks and it doesn’t seem fair. They will enjoy it is practically zero everything. It’s best to be on top of what you put in your body. People don’t realize what’s in soda, etc. These products taste good and are not bad for you. Interesting – I have never heard of this brand before! 🙂 I will definitely need to check it out! It’s a good one. Just be sure to test out 1/4, then 1/2 and see what works best for you. 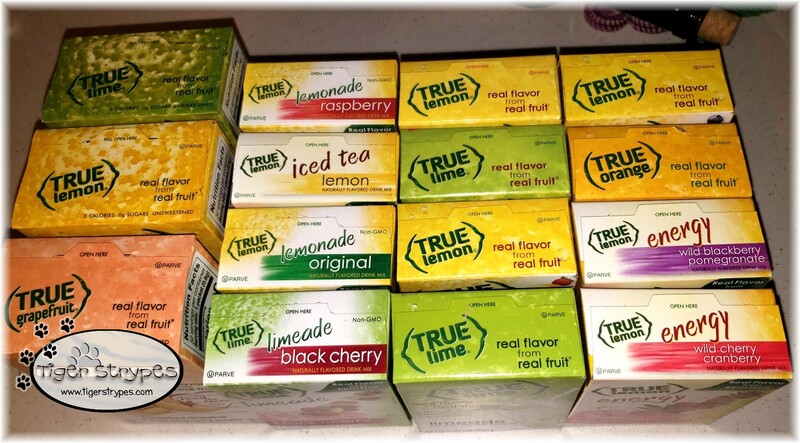 I have used the True Lemon packets before but never as an additive to water–I didn’t realize they made this many varieties now. And those spices are something I’m really going to have to try! They are really adding a lot of new products. The spices are amazing!